Did you ever have a batch that you just knew would be perfect … only, it wasn’t? Sometimes, batches curdle, seize, separate or do otherwise strange things on us even when we think we’ve accounted for all of the variables in our cold process soap batch. Not to worry – your batch is not all lost. 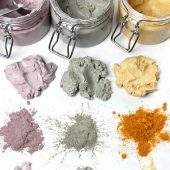 This post will show you how to save each of these formerly-ruined batches. This technique will work up to 24 hours after your batch has been ruined. If you check on your soap a day after you made it and found it’s separated in the mold into an oily top layer and a goopy hard bottom layer, not to worry, this method will work for that too. 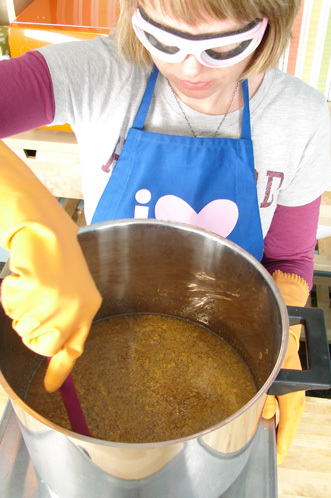 ONE: Wearing all of your safety equipment, pour your entire batch into a stainless steel pot. The lye in your soap is still present because saponification didn’t quite work out the way we had planned on. Your pot must be 3X larger than the batch size. You need a lot of head space for this process. TWO: Put the pot onto the stove. Turn the stove onto medium. THREE: With your goggles on, start to stir your gloppy, blobby mess. It’s okay if it’s still in chunks. It will start to liquefy shortly. Keep stirring. 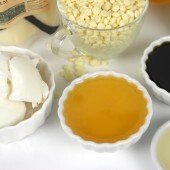 FOUR: If your soap starts to pop oil up at you, turn down the heat until the oil is no longer spitting at you from the pot. You want to stay as close to medium as possible. FIVE: Keep stirring. 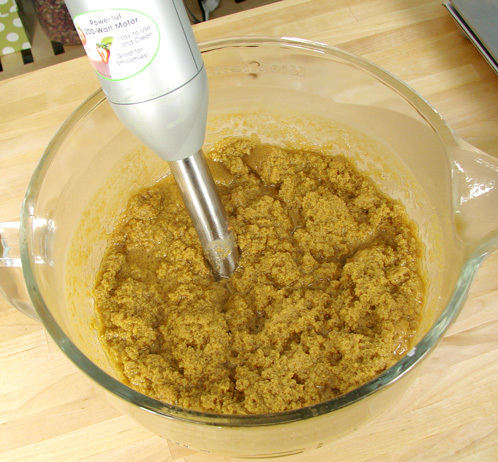 The soap should start to fully liquefy and become an oatmeal like consistency, easily stirrable. 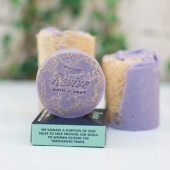 SEVEN: This soap is hot, hot, hot. 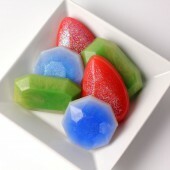 Make sure that the mold you are pouring the soap into can withstand the heat. This plastic mold started to bow on me soon after I put the hot soap into the mold (note to self). EIGHT:Let the soap cool for 24 hours and harden up. The soap is ready to use right away. You have literally cooked the pH down to a soap-level (around 9). 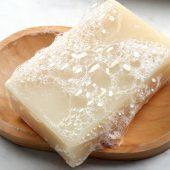 If you let the soap sit for 4 to 6 weeks, it will become harder as it evaporates out its water. 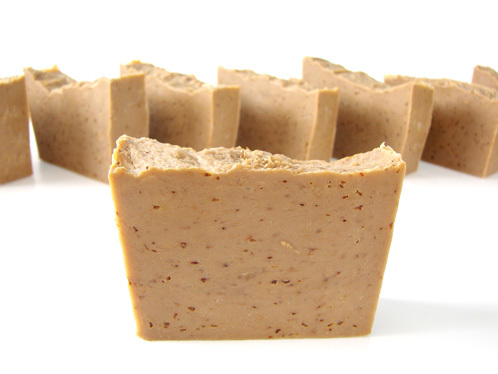 PS – The ‘dots’ in the soap are just oatmeal. The soap itself is perfect and totally usable now (as opposed to when it was a gloppy oily separated mess). Now, was this the design you planned on? Probably not but at least it’s useable soap that you can give away, sell, or turn into a promotional bonus at your craft show booths. It’s far better than (literally) throwing it all down the drain. Previous Post: What’s New? And a Contest! Oh man, what a mess. 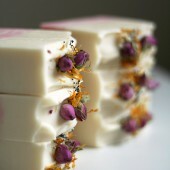 My soap siezed almost immediately when I added lilac fragrance oil. I scooped the mess into the molds, but it hung on the sides rather than falling together. 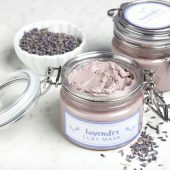 Tried this HP process, and it never would liquefy even though it smoked quite a bit and made my house smell like a lilac nightmare. Ha! I scooped it back into the molds when I got tired of dealing with it, and now it is just a crumbly mess rather than the smooth-but-thick “soap on a spoon” consistency it was before. The crumbly bits look pretty, though, so my question is whether or not it would be a good idea to keep them and add them to another CP soap recipe when it is at trace. 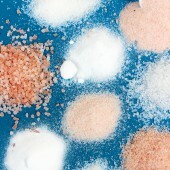 I envision an otherwise uncolored, fragrance-free soap with these crumbles stirred in. Would that work? 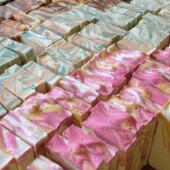 I love making HP soap. Well this is a first for me but its very disappointing. Everything went fine up till trace. 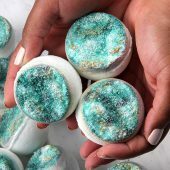 I added my FO and colors and the soap went hard and crumbled on me, no point in molding it since it looked like blue cheese crumbles, without the smell and color lol. Can I save this? If so should I add extra oil,If not im scared it will continue to get hard and burn? Please help. Its a 1lb batch with Vanilla,Pineapple FO and teal coloring. I tried to melt a very small portion of my dry batch and i believe i added too much oil because it wouldn’t set. Hello, hopefully you may know the answer to this. I made a batch of CP soap as normally do however this time it came out of the log “oily”, not oil pockets just oily as if I would have rubbed the whole loaf with olive oil. It’s hard enough to cut but I wonder what happened for the whole loaf to be this oily? P.S. Thank you so much for your order! Hello! 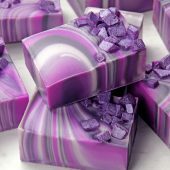 :] I am quite new to CP soap making, and Made my first batch with no problems! 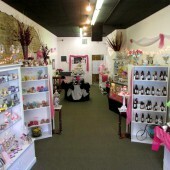 By the way, I LOVE your websites and book on Milk Soap! The white spots could be air bubbles (small, even, pin prick little spots) or they could be un-dissolved lye. I’m guesing that’s what it is though without a tongue test or pH test, it’s hard to tell for certain. Weird liquid orange spots also don’t sound good. 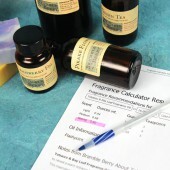 Ugh I would hate to throw out $70 worth of oils! I will have to take some pictures to show you. When I did notice those orange liquid spots was when I first cut it. I will have to try to cut another one to see if I can find it. it is still goppy, so i am going to give it a try! thanks so much. Of course! Let us know how it all turns out! is there anything that can be done after the twenty four hours is passed? I have been making CP soap for nearly a year now and today had my first “curdled”soap. 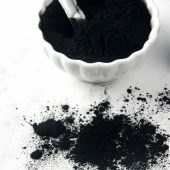 I had a 4kg batch that I split into two jugs after beating with an electric blender and the first one which was a coffee and vanilla worked perfectly normal but the second one which was cinamman leaf oil with cinamman granules curdled. I have made this before and it was great. Why would one batch curdle and the be perfectly normal. I will try putting it inot the slow cooker and see what happens. 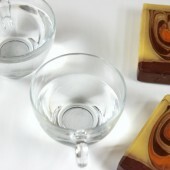 bar soap,using coustic soda,oil ,water,sodium silict,perfum,color. Thank you for your tutorial. I made my first batch of soap today and at the last minute decided to put in some vanilla extract. Your pictures match the result perfectly and I am so pleased that my first batch is now rescued from a trip to the garbage bin. As a bonus now I don’t have to wait the recommended 6 weeks to try it, only 24hrs. Yeah! 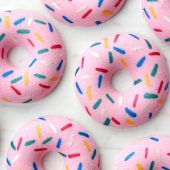 Well, I’m a new soaper and thought that maybe you could help me with a couple of problems. 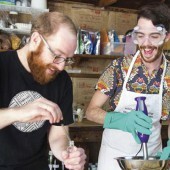 I have made two different batches of soap and have two different problem. Batch two – I added oatmeal I think too soon in my cooking the soap and as it thikened up very quickly I am not sure if it is properly cooked. I am afraid it will be high lye concentration. Both soap batches have set and hardened fine. Any sugestions? 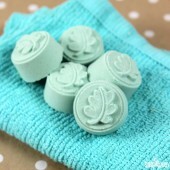 Too much scent will not give you lye heavy soap so you should be good there. 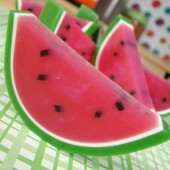 With oatmeal, always make sure it’s long cook =) Were you fully hot processing this soap or was it traditional CP soap? And at what point did you add it? At trace or at the end of the HP soapmaking process? i’m new to soaping. 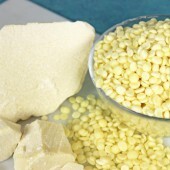 have made 1 cold process and 2 hot process recipe. they all look good. cut well. i’m just not sure if there is lye left. 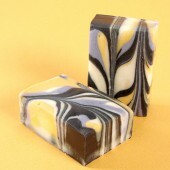 when i do the zap test on the finished hot process soap i taste a bit of sting. this after 2 days of curing in room 65 degree. i’m afraid to use hot process soap now. if i leave curing will it eventually use up the lye? will i not get zapped? i expect to be zapped by cold process but not hot. double checked calcs and did use lye calculator. thanks for the help. Something went wrong with your HP soap. There should be no sting immediately after pouring, let alone two days later. Curing will not solve the soap if it’s still stinging. Something went wrong (not mixing enough, not enough heat, scale malfunction) so I would only use that soap for laundry soap – or you can try to hot process hero it out with an extra 5% liquid oils added to the recipe to ensure there is no lye left. I think you nailed it. I ordered “Potassium” instead of “Sodium”. I will get some Sodium Hydroxide locally and give it another try.Wish I would have thought of looking at that earlier. Anything I can do to harden up the batches I have made? Thanks for solving this. I thought I was doing the procedure right. 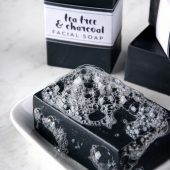 Hmmmmm …….well, you could cook the soap you have at 160 degrees with a little extra water to make Liquid Soap safe (you dilute with water after the cook time by 2:1) but that’s you’re only option. Potassium Hydroxide makes liquid soap. 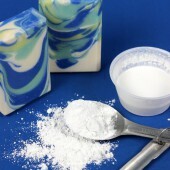 Sodium Hydroxide makes bar soap. Keep asking questions. I’m here to help! SUCCESS! Thanks. I am so excited to try some more! 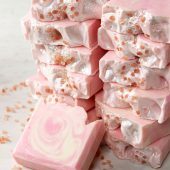 I have tried 2 batches of soap and am not sure what I am doing wrong. They did not harden. I had trace on both batches. 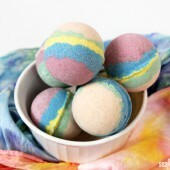 I am using the recipe from the soap queen video with 8 oz. palm, coconut and olive oil. I don’t know if I didn’t insulate them well enough or if they have cooled down too much. It took about an hour for the first batch and about 40 minutes for the second batch until I poured it into the mold. We keep our house cool, 68 in the day and 60 at night. Do they need more heat to complete the sponification process? I have verified that I have added the correct amounts of each ingredient. I tried a recipe for shaving soap also and that had a medium trace but is still soft after about 4 days. I am trying to make this as a Christmas present. Any suggestions? You’re not hitting a good trace is my best guess. 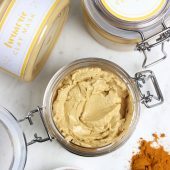 What are you using to mix your ingredients? 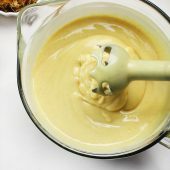 Are you using a mixer, like an egg beater type of mixer? Your trace should be coming in 3 or so minutes with a stick blender so that’s what’s giving me a red flag there…. I used a stick blender. 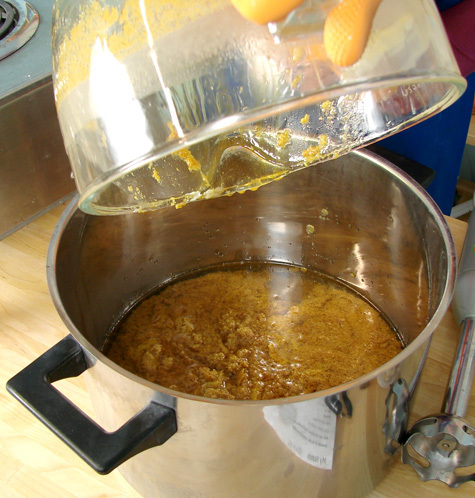 My first batch seemed to separate when I added the essential oils after I had reached trace. It was only a thin trace. The second batch I beat it longer after adding the essential oils and it didn’t separate out but it never got hard. 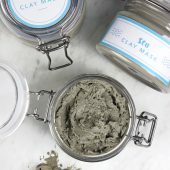 Should I pour it into the mold as soon as I see trace after adding the essential oils? I wrapped it in towels also but it didn’t seem to give off heat like I have read that it does as it is completing the saponification. I have read about a false trace also. Thanks for all your help and love your site. 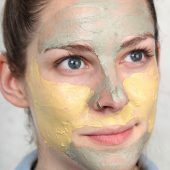 Look at the Lye that you’re using? What’s the label say? Could it be potassium hydroxide? 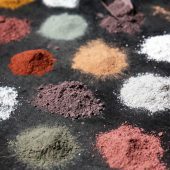 That’s the next thing that I’m thinking could be the issue because if you’re weighing everything out and are positive about your recipe (but let’s talk about that recipe – have you run it through the lye calculator at brambleberry.com? 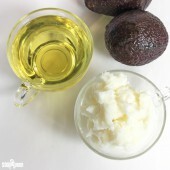 What’s the superfat? 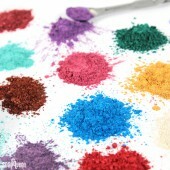 ), the entire process is a chemical reaction. When you have A+B you always get C (in this case, soap)so one of the variables is off – we just need to do some detective work to see what’s off. 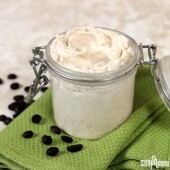 I bought all my supplies from Brambleberry including the lye and am using the recipe from the video, 8 oz. 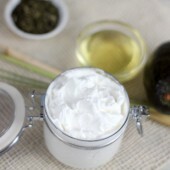 each of palm, coconut and olive oil, 3.4 oz lye, 7.9 oz. water. I will probably try it one more time tomorrow (wed) so if you have any more tips it would be great. I’m not ready to give up yet. Okay, one more thing, does it say “Sodium Hydroxide” on the container? Or does it say “Potassium Hydroxide”? I just ran that recipe one more time to be on the safe side and it’s right on with the lye and water amounts. It should be rock hard (!). I may have you send me a bar of the super soft soap from each batch and we’ll keep working through this. I know this article is older, but thanks! My batch curdled after putting it in the mold. I think my issue was caused by the FO causing acceleration. It’s happened to me twice now. I successfully saved my second batch thanks to your post! Aw, thanks for letting me know the good news =) I’m so happy that you were able to save your soap. Even if it’s not as pretty, it’s fantastic that it’s a usable batch! I am beginning soap maker and I have no idea about any thing concing soap making and I want you to help me with your method and I need CD. I would be happy if you could help me to get equipment and also to know the cost of it as urgent. 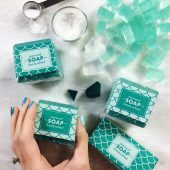 I would recommend starting with the free resources at SoapQueen.TV and then scouring the Cold Process section of this blog. Okay what can you do with soap that just crumbles when you go to cut it? I made a 10 lb batch and separated it to two 5 lbs. One batch was perfect and the other batch crumbled when cut. Two different fragrances, so I guess it had to do with fragrance. But any ideas how to save a future batch that does this? But if it’s too brittle, you can grate it down, add extra oils and hot process it out/rebatch it out and that will “save” the batch. 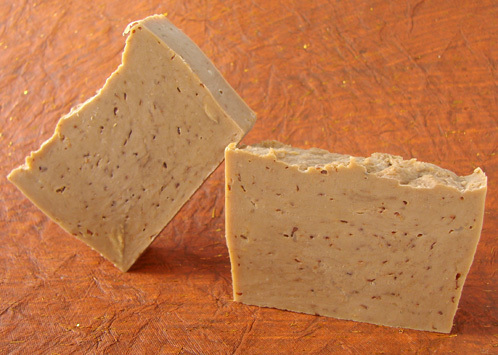 But remember, rebatch/hot process has a very rustic look compared to cold process soap. THERE ARE TINY WHITE SPECKS IN MY COLD PROCESS SOAP. 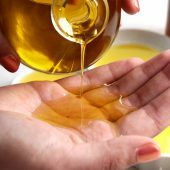 I USE COCONUT OIL, PALM OIL AND PALM KERNEL OIL. Sometimes air bubbles look like white specks. Could they be air bubbles? 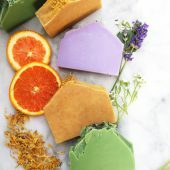 So I stumbled across this old post today as I was trying to figure out what happened to a beautiful batch of soap that curdled on me, after adding the essential oils (I used ylang-yland, lavender, and spearmint). 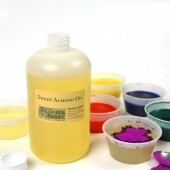 I had also added some annato powder at trace. I’ve never had this happen before, and I’m wondering if I should continue to let it cool (I let it go through gel phase in hopes the consistency would smooth a little), or should I dump the whole thing into a pot and cook it? My concern is will the essential oils burn away during the cook? How hard is the soap right now? 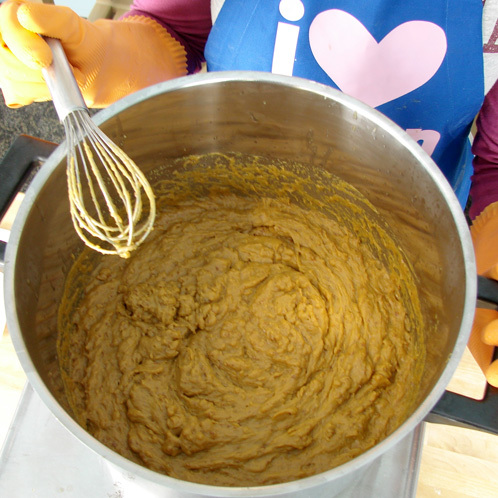 If you can still spoon it out of the mold then you can put it on the stove and hot process it. It the batch is hard where you could possibly cut it, I would just let it cool all the way, grate it down and rebatch it. 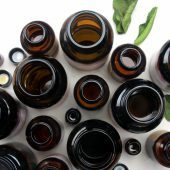 The essential oils may burn off a little with super high heat, but if you’re hot processing or rebatching you can always add a little bit more if you’re concerned. Wow, thanks for this info, I saved a batch of soap with a lot of good oils in it. THANK YOU! HI Courtney – thanks for your emails. I watched the videos (great!) and have rebatched using double boiler. 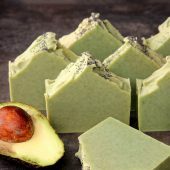 (There were what appeared to be lumps of cocnut oil in the soap but I heated and stirred until smooth – don’t know what it’ll turn out like?) Question: If the white spots are coconut oil that started to solidify while waiting for trace,(and I fear this is the case), is there any hope in salvaging the soap? there are a couple more batchces with the tiny white speckles in them. Is it ok to leave it as is and/or will rebatching fix the problem? My stick belnder arrived today so I shouldn’t have to revisit this situation with new batches (hopefully!!). It really depends on how much of the curing process has already taken place. 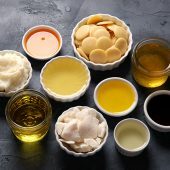 Generally 90% of the curing process happens with in the first 24 hours so the coconut oil will probably act as a superfat (unsaponified oils floating in the soap). Let me know how it turns out and HOORAY for your stick blender. You’ll never go back! Very good tutorial! This really is so practical for when those little nuances take place and you had great intentions, but something, sometimes unexplainable, goes wrong. 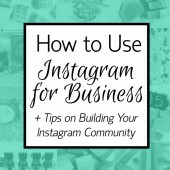 Thanks for the images that really make these tips so easy to follow. We can all benefit from this! Hi Anne-Marie. My name is Claudia E and I´m from Monterrey, Mexico and your fan too. Congrats for your baby!!! I think it´s gonna be a sweet little girl. 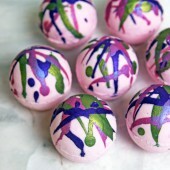 I´m a small business owner (http://www.lacatarinamty.blogspot.com) and want to start making M&P soaps. I´ve seen you videos on Youtube, thanks for that invaluable information. 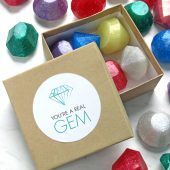 In somewhere, I´ve read you have international shipping but I want to ask if you have a dealer in Mexico because the products I´ve found here in Monterrey have poor quality (I can´t belive this because Monterrey is the second city most important of Mexico). Thanks in advance. Have a nice week!! But at least you saved it! I think that really great Christmas paper can save anything (ha ha) and a nice ribbon is also a great touch. At the very least, it could be a promo for you – buy 3, get 1 Green Monster free – or something. I had to add an update! I just cut my soap using your instructions and it was a huge success! The soap is suprisingly nice looking. I was worried about it being gloopy with air pockets but it’s near close to CP soap. I added a bit more fragrance to it to ensure nothing was cooked out and it smells fantastic (I used your OMH f/o) It also feels wonderful too, still a silky great lather! So thank you! What a soap saver! Here I am giving all kinds of tips out like I actually knew something…. jump up and down about. separated into a yuck green slimy mass with a downright ugly oil slick leaking out underneath the mold. So glad that you posted this tutorial! I sliced huge hunks up and threw it into the crock pot and it melted down in about 45 minutes to a nice homogeneous mixture which I was able to stir together with little effort or patience. Today it sliced right up and although the color is lime green and kelly green, and doesn’t look like a beautiful Blue Spruce tree which was the original intention, I think it will be a great soap. Maybe I can wrap it in some trendy Christmas Paper and no one will notice, lol! Oh, that’s great! I’m so glad that you found it informative. I wish I had known about the process when I first started soaping at the age of 16. =) It would have saved me those first 5 failed batches! 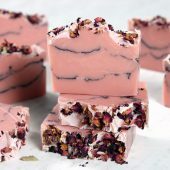 Oh, that’s an interesting thing – I actually sometimes will polish my CP soap up with cold water and a rag so that makes sense that you could do the same thing to HP soap. We have a Farmer’s Market gal that does HP here for the same exact reason. It’s much easier to plan inventory. 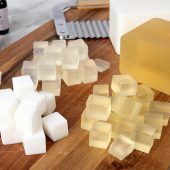 You may want to note about how long it will take to cook a batch for hot process, since it goes through stages, gelling, re-liquifying and then cooked soap. 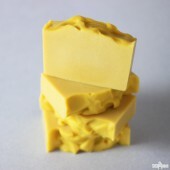 Just so people don’t get it to the first stage and throw it in a mold.. they’ll still have lye heavy soap. But hot process definitely IS a life saver at times. You can also do it in a crock pot or in the oven. THANK YOU!!!! Being fairly new to cold process soaping, I blow it more often than I care to share! Thank you for giving me a way to use it anyway. I just hate to waste all those ingredients! 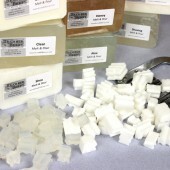 When I joined the Farmer’s Market, I had to make alot of soap very fast. So I chose to make alot of hot process soap. 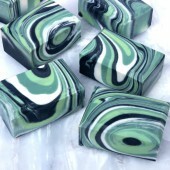 It might not be the prettiest soap on the block, but it is very high quality and long lasting. Even in the fancy boutiques it is selling, which amazed me. I like BEAUTIFUL soaps. LOL…. I have found a little trick that some of you might already do but it’s helping me alot. 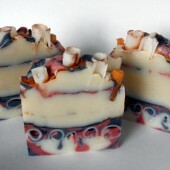 I cut the hot process soap and let it dry for about a week, then I “use” the soap for one hand washing. Then I let it dry for another week on a raised cooling rack. 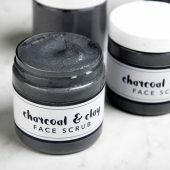 It really smooths out the soap and makes it look more high end and “cold process-y”. I also did this very DUMB thing; I actually did it about 3 times. (Isnt’ that the def of insanity?) (Doing the same thing over expecting to get different results…. I discounted the water on the recipe and it became too crumbly to adhere together. 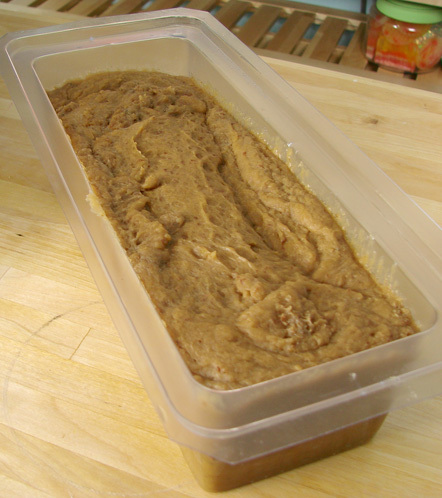 No amount of water can paste it back into the loaf. So I grind it up and put it into MP for a superior long lasting bar….. The Icing is Whipped CP. Wow how strange this blog comes at a crazy perfect time! I JUST ruined a batch of soap about 24hrs ago. I’ve never tried rebatching before but I am eager to give this a whirl now! Thank you for your descriptive instructions and photos! What great timing! Thanks for the info. I hope I never have to use it, but glad I know how, just in case! 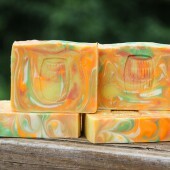 The soap turned out great! Seizing is totally doable for HP’ing it out in the oven (assuming you’ve got oven safe molds of course!). When the soap separates and turns into a gooey, disgusting, oily, chunky mess, you need the stirring that the stovetop HP gives you. I’m so glad that you were able to save your batch! 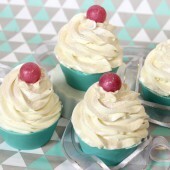 Did you frost it with whipped CP soap or actual icing? Love how it turned out. I am an experienced soap maker, and very seldom does this happen to me, but just the other day for no reason I can figure out (maybe my essential oils) my batch seized. But rather than cooking it, I placed in the oven for a few hours, and this seemed to work out pretty good. 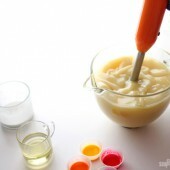 You can see the cake I made here http://mountainfarmsoap.blogsp… The icing I did as a separate batch. I love your blog by the way and congratulations on your pregnancy. The texture definitely changes compared to regular CP soap so that’s something to keep in mind. I only do it as a last resort but it has saved many a’batches for me. Thanks y dear for your answer! Bleed like making holes in the swirls… In fact my daughter wanted three bars because she thinks they are pretty… but HOLES! Bleed like how? With oil seeping or the colors bleeding (or making a halo?) Sometimes, with a light oil bleed, I sop it up and don’t worry but with much more than 1/2 ounce, I always HP it right out. Very nice. Wish I would have known about this Saturday when I had a huge mess on my hands. 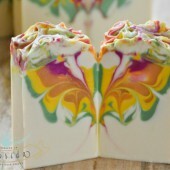 My soap was turning hard while I was adding color and fragrance. I’ll try this next time. Thanks! I’ve just finished a rebatch… And hoping for a better end! 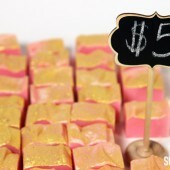 I wish I had seen this tutorial about 2 months ago when I made my very first batch of soap. It would have saved my oily goopy mess 🙂 great tip!! Very cool! This might also be something that could work for someone that needs it asap? I wonder. Does it work if it has set up right if you do it within 24 hours?